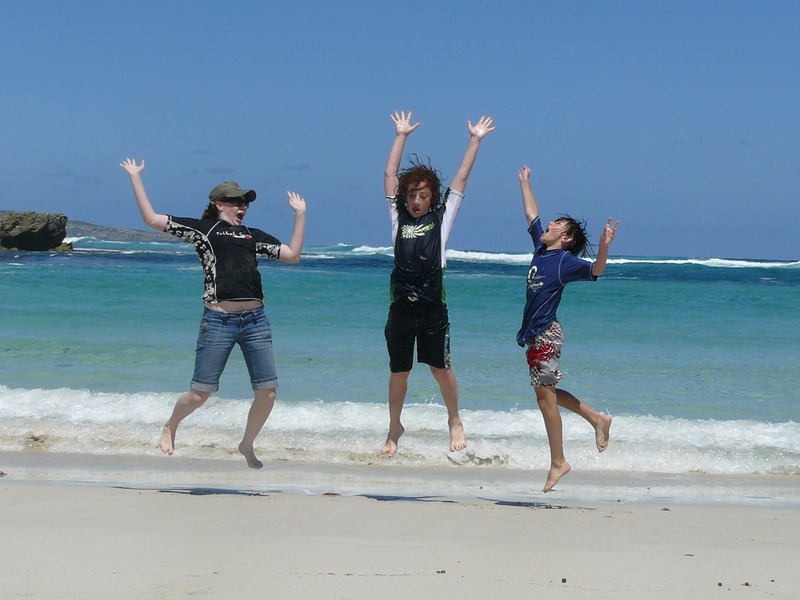 We flew from Sydney to Adelaide then drove to the ferry to go to Kangaroo Island. 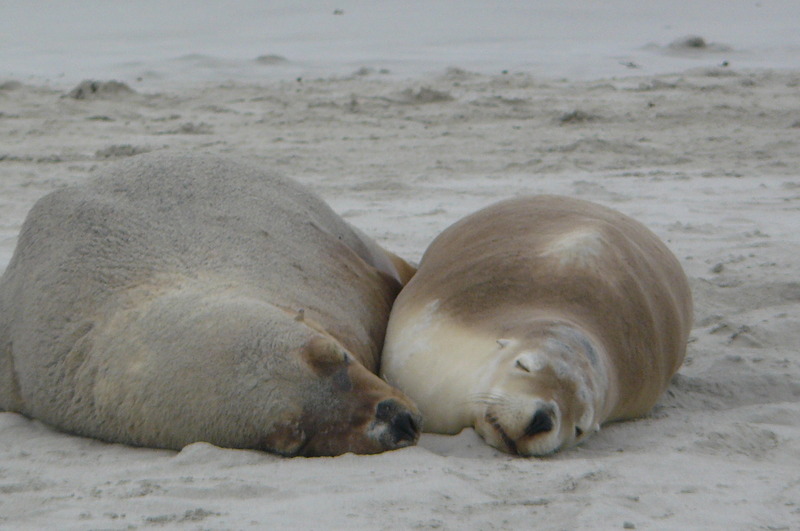 When we arrived, we went to Seal Bay where we went on a guided walk on a beach with lots of sea lions lying down and doing different things. Some of the babies were swimming in the ocean and others were walking on the beach and calling to try and find their moms. It was really cool. 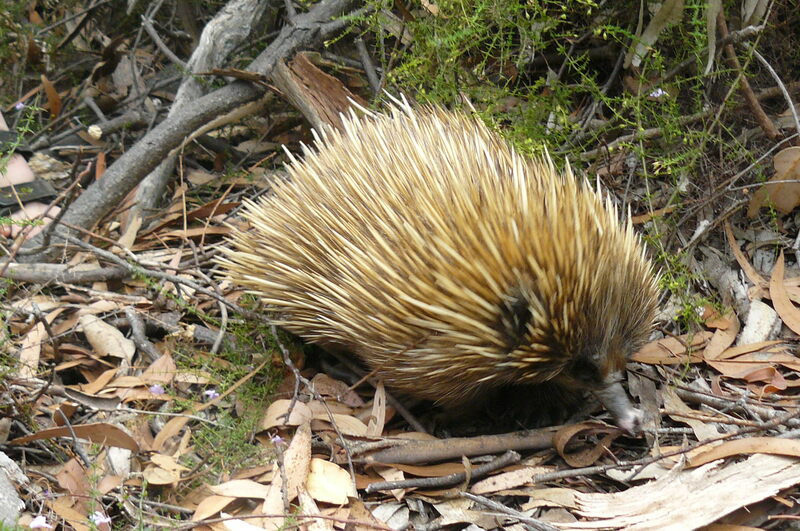 After that we stopped at Kelly Hill Conservation Park to look for echidnas which kind of look like porcupines mixed with small anteaters. It is a Monotreme mammal which means it lays eggs. It is one of only 2 animals in this family, the other being the platypus. We went along the path and didn’t see anything until we saw this guy and he said he’d seen one at the start of the path. We ran back to the start and couldn’t find it, but then my mom and sister saw it next to the path. 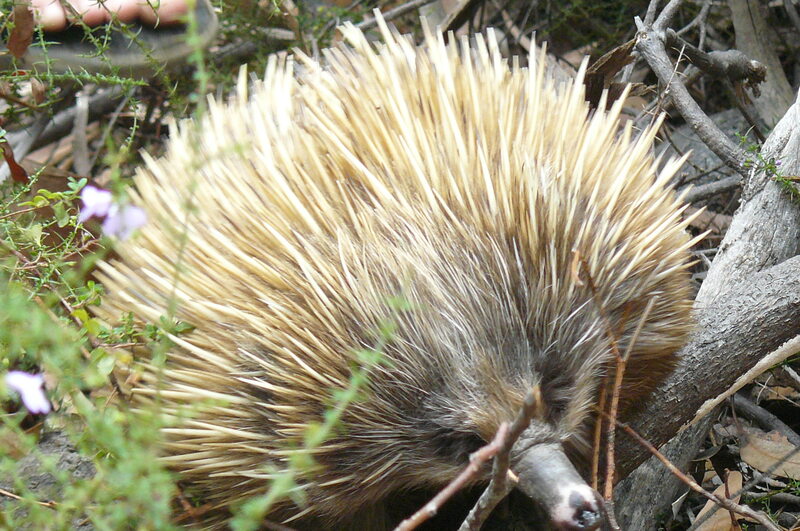 It was really exciting as echidnas are very rare and lots of people haven’t heard of them. We also saw 2 Kangaroo Island Kangaroos – one was an adult and one was a joey. 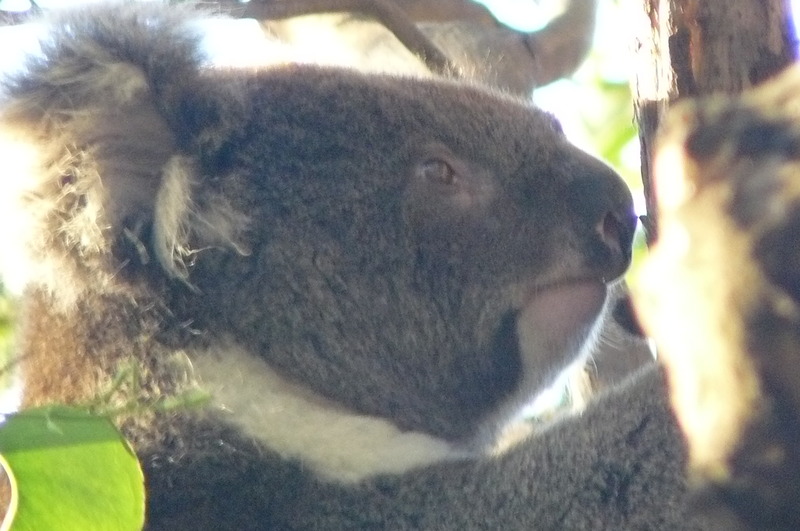 Then we went to Hanson Bay Wildlife Sanctuary to find koalas. We walked down a wide path with eucalyptus trees on either side. 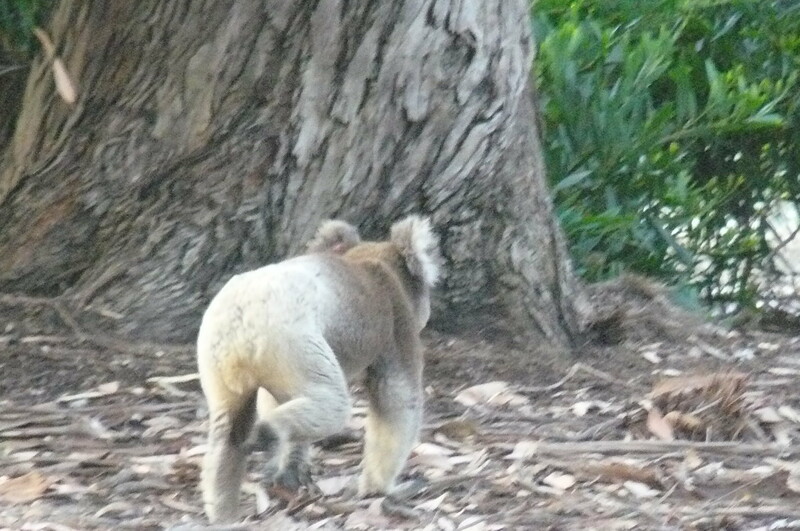 We saw 3 koalas really low down in the trees and one making really loud sounds and running on the ground. 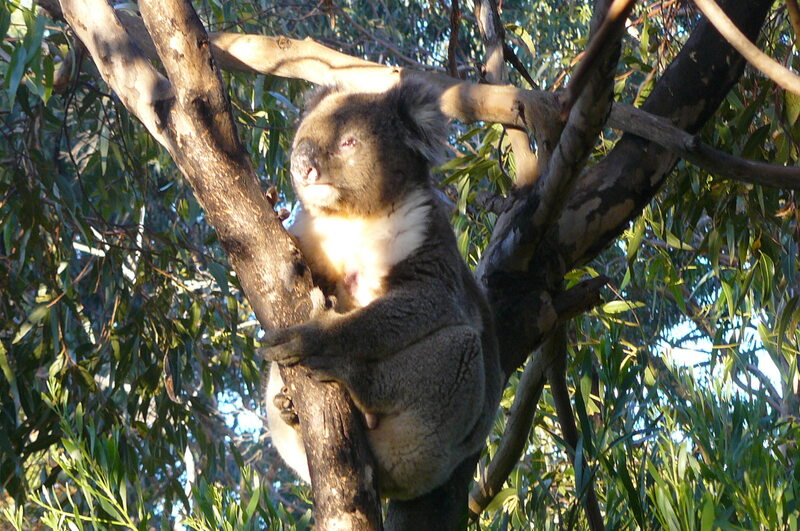 We were able to get very close to the koalas. Then we drove to our hotel, Kangaroo Island Wilderness Resort. On the way we saw lots of Tammar Wallabies and a few more kangaroos. 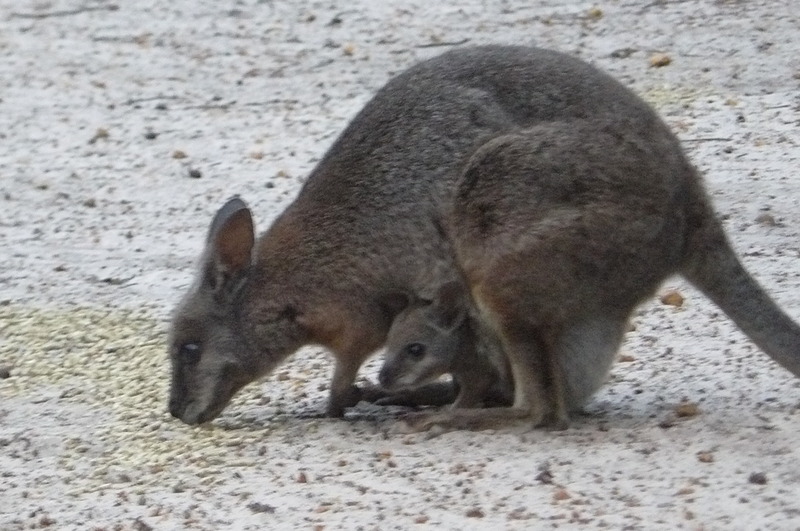 In the evening at the hotel we saw a kangaroo and more wallabies and we got to feed one. There were also some Bushtail possums and one with a baby in its pouch. The next day before breakfast we saw a baby wallaby in its mom’s pouch. 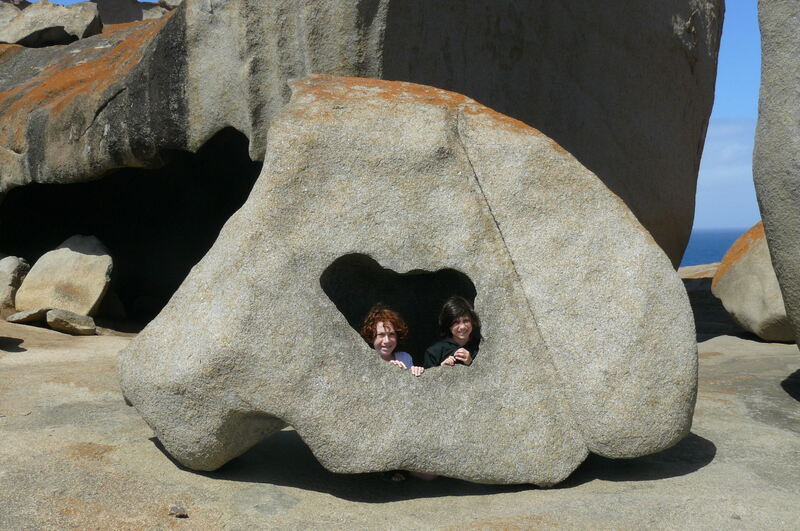 Then we went to the Remarkable Rocks in Flinders Chase National Park. 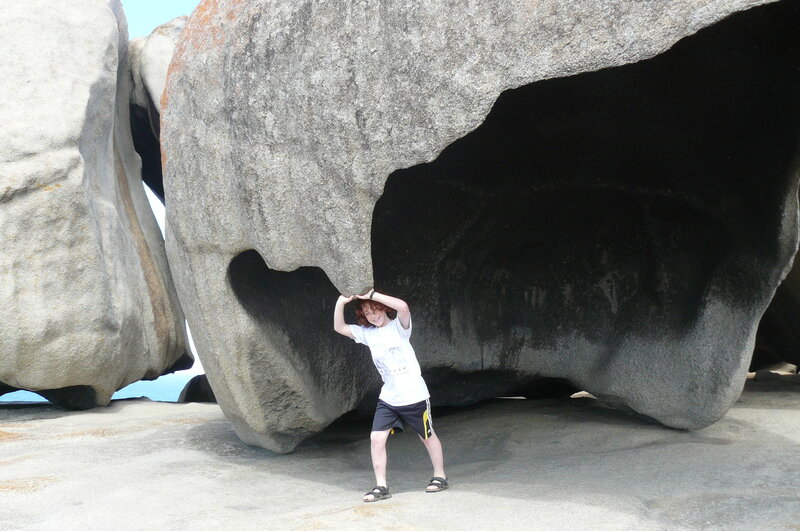 The Remarkable Rocks are a bunch of really weird, big granite rocks. We climbed up some of them. It was really fun. 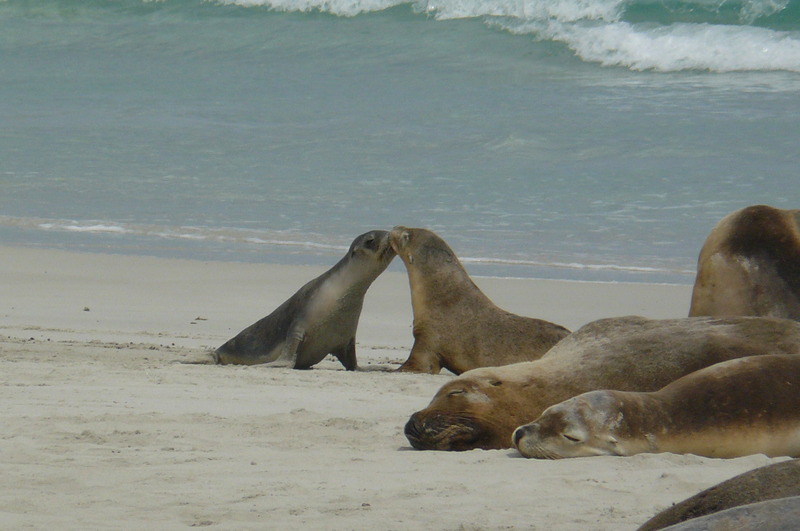 After that we went to Admirals Arch a place where New Zealand and Australian Fur Seals are found. We walked down a boardwalk and saw lots of fur seals. Some of the males were play fighting. 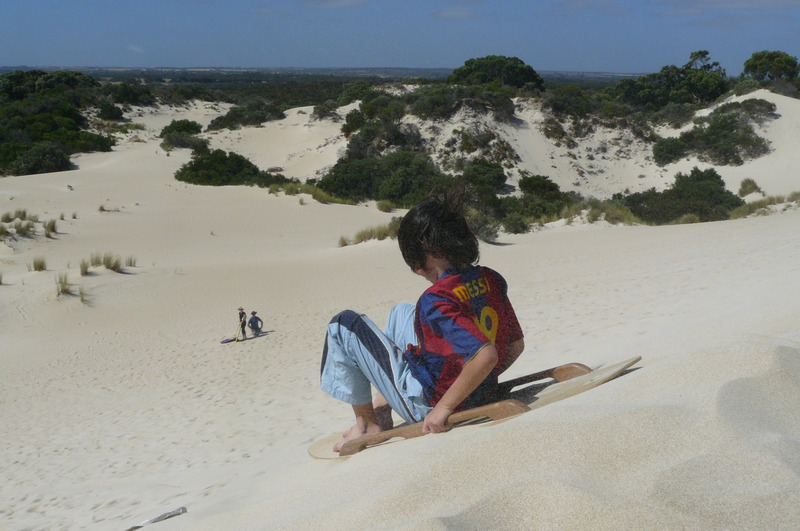 Then we went to this place called Little Sahara where we went sandboarding which is where you go to the top of a sand dune and sled down it. Sometimes instead of sitting on the sled I would stand on it. 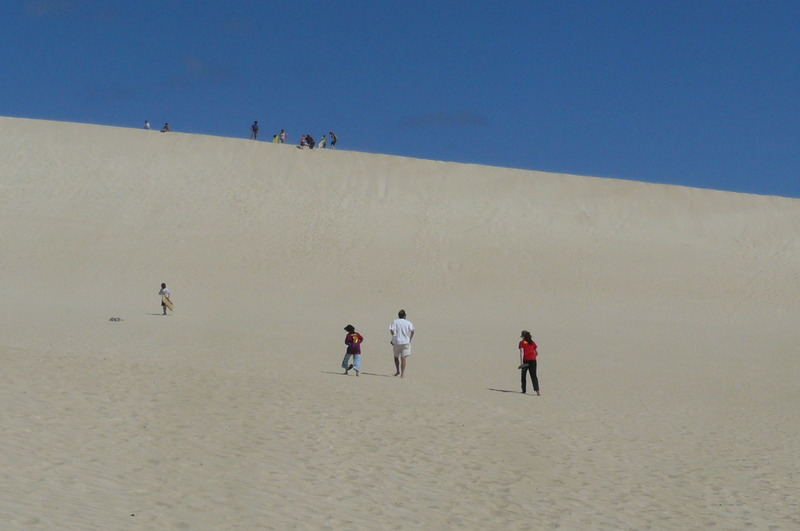 It was really fun, although very hard work because after sledding down, we had to trudge up the very steep dunes. Also, we all had sand in our hair for days after that. 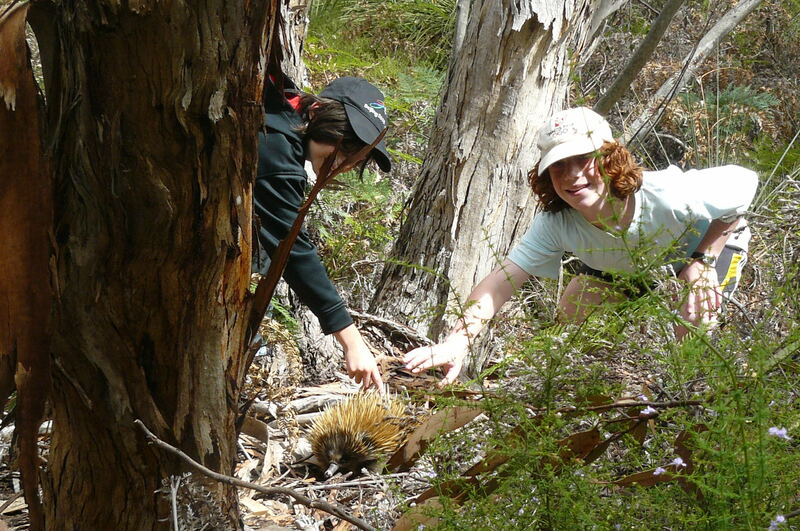 The next day was my brother’s birthday and we first went to Kelly Hill Conservation Park again where we saw another echidna. It walked across the path right in front of me. It was really cool. Then we went to Hanson Bay Wildlife Sanctuary where we saw more koalas including a baby that was jumping from one tree to another and one running around on the ground. We also saw some Cape Barren Geese. Then we went down this really bumpy road to Hanson Bay beach. On the way we saw 2 heath goannas which look like big lizards with blackish tails. 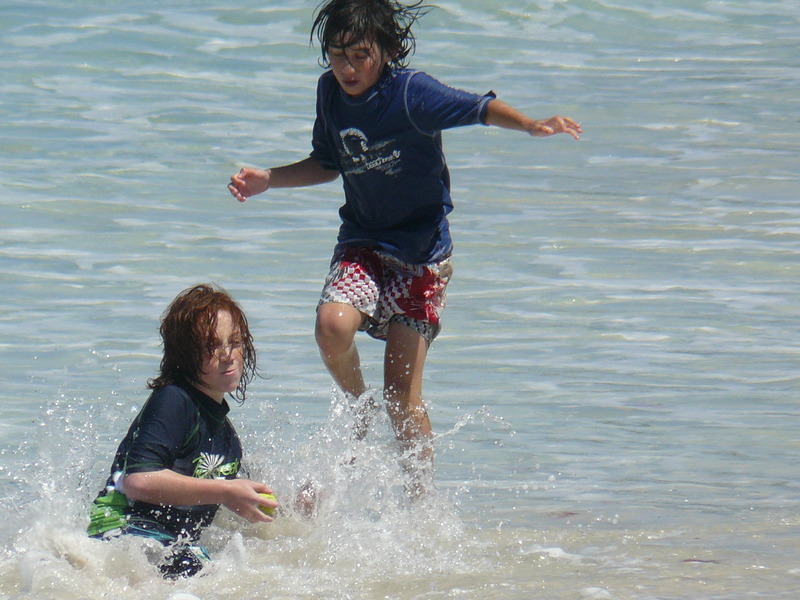 When we got to the beach we went swimming. We were surprised that this beautiful beach was totally deserted. We played in the water and my mom and sister built sand statues. After the beach we drove to Kingscote, the largest town on the island, although actually a very small place. 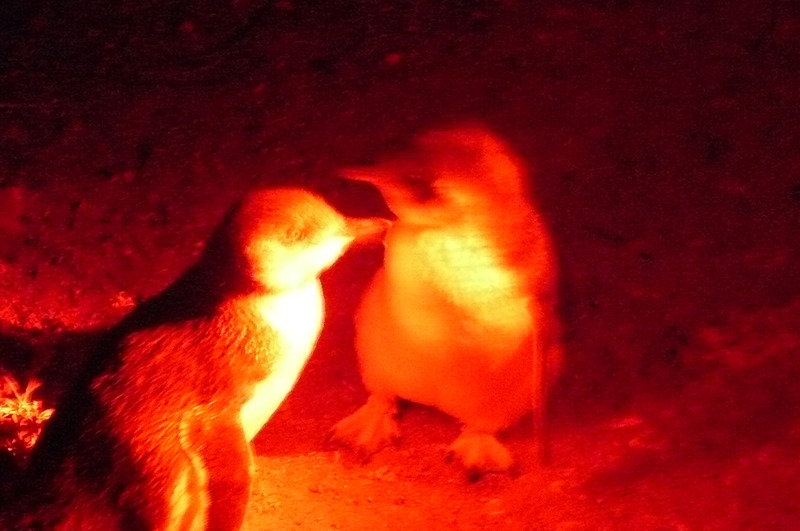 When we got there we went on a nocturnal penguin tour to see fairy penguins which are the smallest penguins in the world. We saw some of the adults molting and we saw some babies. We saw 3 babies together that they thought might be triplets and scientists from Sydney were going to come to get blood samples, because if they were triplets, they would be the first triplets ever in the species. It was very interesting. The drive back was very dramatic. It was very dark and possums, wallabies, kangaroos, and koalas were constantly crossing the road. My dad had to keep slamming on the brakes to avoid hitting the animals. We were all very relieved to get back to the hotel without harming any animals. Next day, our last, we spent going back to the places we’d been before. There was one last piece of big drama. Having crossed by ferry onto the mainland, we were driving towards Adelaide when my parents discovered they’d somehow left our passports at the hotel on the island. As we were flying from Sydney to New Zealand the next day, and could not get the ferry back because it was full (and we would have missed our plane to Sydney), they become quite frantic. In the end, they managed to get the passports flown to Adelaide and my dad collected them, although he had to spend the night in Adelaide. When he met us next morning at Sydney airport with 5 passports, we were all quite relieved.